I have been seeing Pixi Beauty everywhere lately and after following them on Instagram I fell completely in love, so you can imagine my excitement when they offered to send me some of their products. 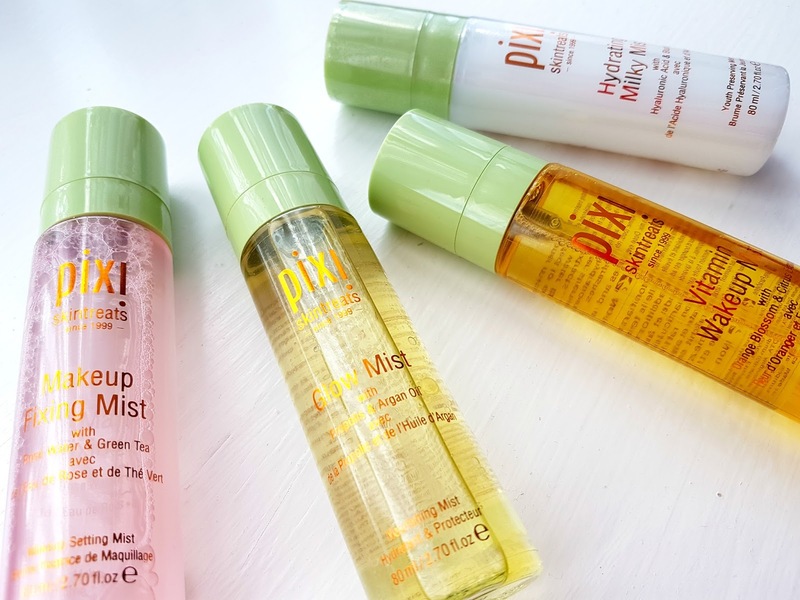 For my first Pixi review I thought I'd start with these gorgeous mists, when I opened them I did a little (okay a massive) happy dance! I'm pretty new to face mists and if you've been following me for a while you will know that I'm a nightmare when it comes to skincare and having a routine. 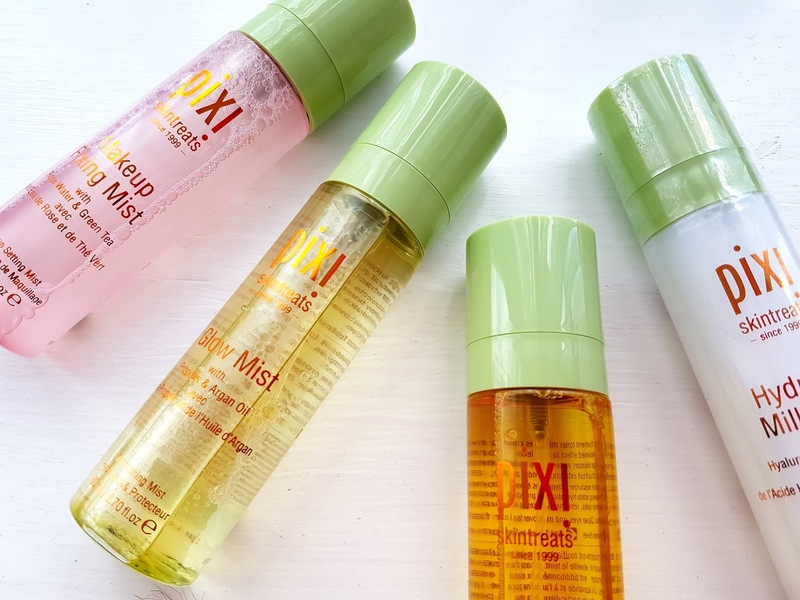 The 4 mists Pixi released cover pretty much everything from setting your makeup, to hydrating your skin, to giving you a glow and to helping your skin look happier and more awake, so here is what I thought of them! This is hands down my favourite one, I use it religiously. It's infused with rose water and green tea and smells absolutely gorgeous. I know some people aren't a fan of rose water scents but personally I absolutely adore the smell and think this product works perfectly. I use it every day to set my makeup and it's been a complete life saver at prolonging my foundation wear, especially in the hot weather! This one is perfect for Summer and anyone who loves a nice dewy look to their makeup. Personally I'm not a massive fan of dewy skin but on days I quite fancy it I love using this and it's a must have if that's your thing. I've always suffered from quite tired and dead looking skin so you can only imagine how much I appreciate this one, it instantly brightens up my skin and helps it look alive. I love to use this both in the morning to make me feel more awake and to make my skin feel less.. eugh, and before my makeup just to add a little extra something. This is the one I reach for least but I still do love it, if you ever need a burst of hydration this mist has your name written all over it. It really moisturises your skin and leaves it feeling so lovely and soft. There's nothing really to complain about when it comes to these, they all do as they say they do and can we just at how cute the packaging for them all are?! They look AMAZING sitting on my dressing table and the makeup fixing mist has secured itself a place in my everyday makeup bag. Have you tried makeup mists, or even better yet Pixi mists? Be sure to let me know down in the comments and if anyone has any Pixi products to recommend I'd love to hear them! Make sure to go follow me on bloglovin HERE, I had a major photography day today so I've got so many posts lined up to get to you all soon! A lot of people have been recommending the Milky & Glow Mists. I need to try them soon! I really want to try out Pixi skincare products. They have such a wonderful range and many products that are capturing my interest. These face mists sound incredible. These all sound amazing, I'm a big fan of mists and a big fan of Pixi so what's not to like! I also really want to try their SPF mist! Yeah I want to try that too!! I have the Hydrating and Vitamin Mists and love both of them. I'll have to try the Make up Fixing Mist next. Deffo should try that one! I have the glow mist and loved it when I was traveling; it was so good for a skin refresher! Now you've got me convinced I need to get the other 3! yes it is, and you so should!